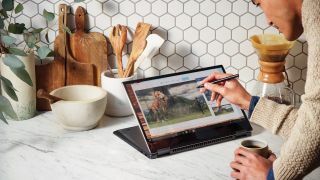 A new leak suggests that the Windows 10 April Update, which was formerly known as both the Spring Creators Update and Red Stone 4, is set to land on May 8, which makes the recent name change a bit unfortunate. Update: It's now been confirmed by Microsoft that the Windows 10 April 2018 Update will release on April 30 for people who want to manually download the software. If you want to wait for the automatic update, it looks set to start rolling out on May 8, as these rumors suggested. The update was previously delayed due to a critical bug being found, and now an internal memo from a Chinese retail vendor, which was posted on Twitter by a user named FaiKee who took it from a Chinese website, suggests that ‘Windows RS4’ will be released in China on May 9, which would be May 8 in the US and UK. May 8 coincides with Microsoft’s ‘Patch Tuesday’, which gives some credence to the rumor. A follow-up tweet states that “this is said to be an internal memo to dealers' shops”. Of course, nothing has been confirmed by Microsoft about the release date for the Windows 10 April Update, so until we hear from the software giant directly take this with a pinch of salt. The memo could also mean that the particular Chinese vendor is getting the update on May 9, but other vendors may get it earlier. To be honest, we were a little baffled when it was revealed that Microsoft had changed the name from the Spring Creators Update to Windows 10 April Update, as at the time of that announcement Microsoft only had around a week if it was to release the update in April – and it only has four days as we write this. If this latest leak is accurate, then we may witness the confusing spectacle of Microsoft releasing the April Update in May. Or, we may get yet another name change. However, all we want to do is safely update our PCs.